Personal Work: The HDR Hole…. Landscape photography is a passion of mine. It’s what originally drew me to the camera and it’s what I shoot for myself whenever possible. Vermont is such a gorgeous state to be a photographer in, offering endless possibilities for landscapes and portraits alike. The past couple of years I’ve been digging into HDR photography and trying out some of the new techniques associated with it. If you have never heard of it then basically what you need to know is that HDR allows you to combine several exposures of the same scene into 1 photograph, thus increasing the tonal range of your final image. You can get details in a both a bright sky and a dimly lit foreground. The first image below is one example. This is from my front deck (yes, in Vermont you don’t have to go far to find the stunning natural beauty). I couldn’t expose for the sky (gorgeous 5am sunrise) and the foreground in shadow. Either the sky would render too bright, or the foreground would be too dark. HDR allows us to eliminate that technical hurdle. There is a huge debate on weather that is “cheating” or “real photography”, or even pleasing to the eye. I will leave that to those that care to debate. For me, it’s just great fun! Below are a few of my favorites from the past year. HDR is a huge learning process. While it’s relatively easy to begin, it’s very challenging (and rewarding) to make images that truly stand out. I’m not quite there yet on this but working on it! Check out Trey Ratcliff for some jaw dropping, unbelievably beautiful images and a great tutorial on how to do this yourself. I’m consider myself in the beginning phases of making these kinds of images, which means they usually come out cheesy and over processed, but hopefully I’ll continue to refine the technique, bringing them closer to a timeless art than a temporary fad. And for a quick laugh, review the graph below. 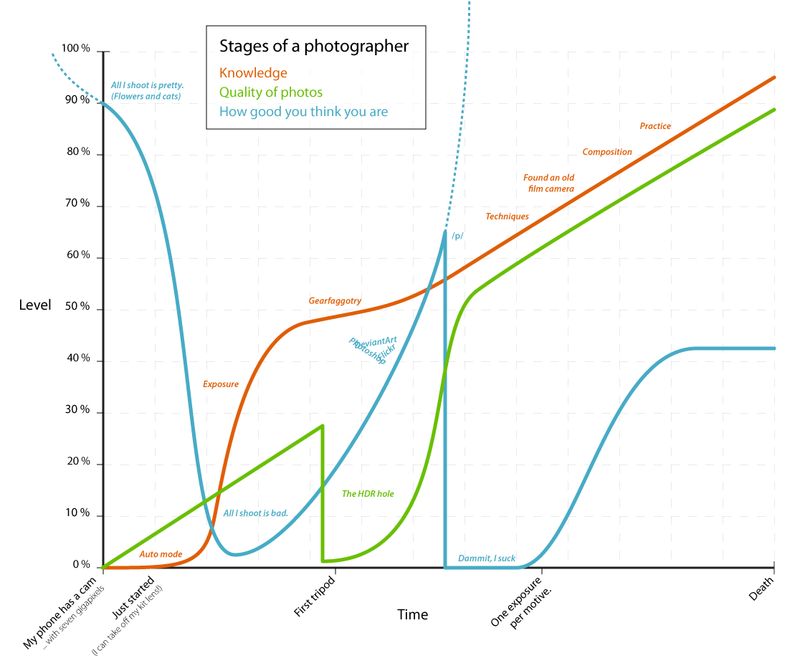 I couldn’t find an original source on this (it’s bounced around several blogs) but whoever made it was well in tune with the stages a photographer passes through, including the decent into the HDR hole. Hopefully, I will emerge from it, unscathed. Can anyone spot the tripod leg in the shot above? Pure stupidity on my part not noticing this as I composed, it was camouflage! The image still works, in a sort of a where’s waldo kind of way.